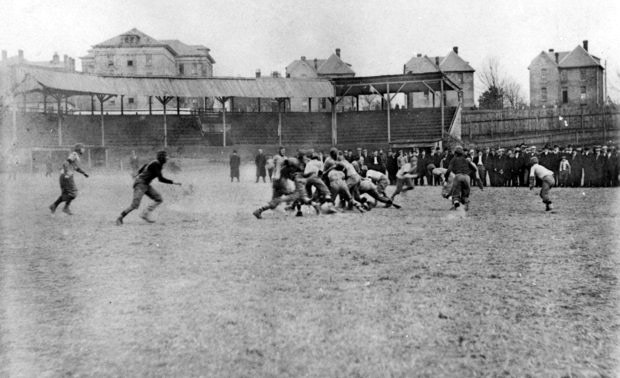 The first NC State football game was held in 1892 at at the State Fairgrounds, then located across Hillsborough St. from campus. Track events also took place at the fairgrounds. Early baseball games were held in Pullen Park in a clearing known as Red Diamond. Realizing the need for a central sports facility for college athletic events, alumni and faculty raised money to establish an athletic field on campus in 1907. It was built in the flat, low-lying area behind the dormitories then lining Pullen Rd. Its modest amenities included wooden bleachers and a grandstand. A football scrimmage at Riddick Field about 1914. In 1912 students voted to name the stadium Riddick Field in honor of Wallace Carl Riddick (1864-1942). He had been appointed professor of mechanics and applied mathematics in 1892, and became the university’s first professor of civil engineering in 1895. Riddick later went on to serve as NC State’s first football coach (1898 -99), and as president of the university 1917 -1923. From 1923 until his retirement in 1936 he was Dean of Engineering. Dean Riddick died in Raleigh in 1942, having loyally served NC State for 50 years. In 1916, the wooden bleachers on the west side of the field were replaced with a poured concrete grandstand. The West Stands were built in stages, with the graduating senior classes donating the money needed to build one section at a time until it was complete in 1923. Construction started on the East Stands in 1924 and was finally completed in 1935. 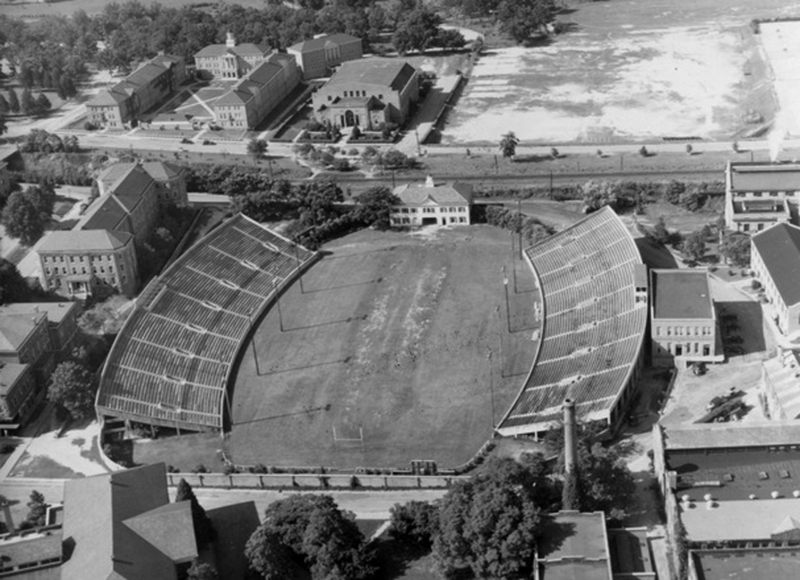 A two-story Field House addition in the south end zone completed the stadium complex in 1936. The Field House was designed in a modified neo-Georgian style of solidly-built poured concrete. 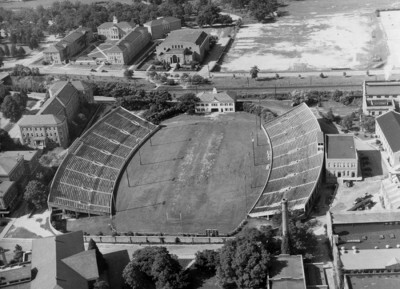 The aerial photo above shows the completed Riddick Stadium as it appeared in the late 1930s. Below is a view of the Field House about 1940. 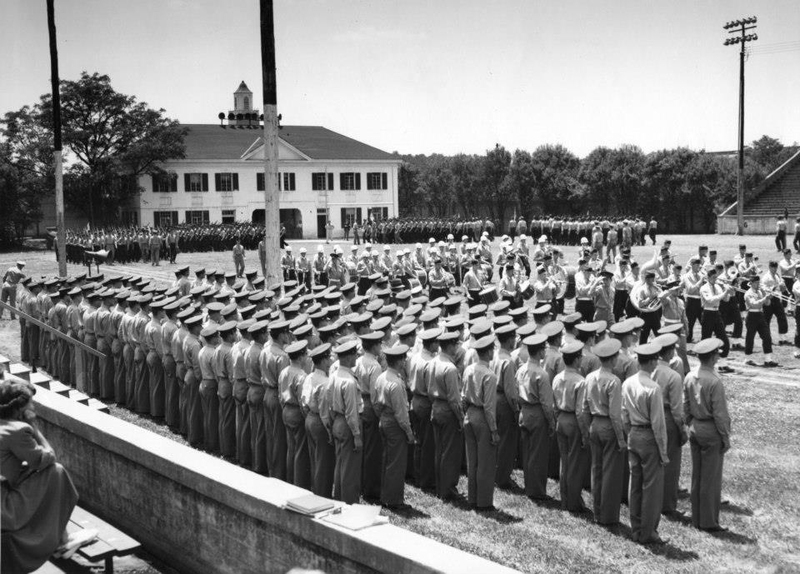 Another view of the Field House taken about 1950 shows the State College marching band and an ROTC Unit. By this time loud speakers had been mounted on the roof. 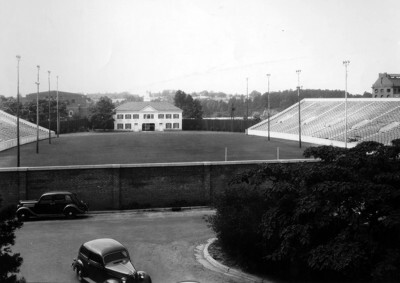 The central campus stadium was home to the football and baseball teams until 1966, when Carter-Finley Stadium was completed in West Raleigh. Baseball games were relocated to Doak Field off Sullivan Dr., also in 1966. After old Riddick was vacated, its importance to the university quickly diminished. The East Stands were torn down in 1968 and a parking lot was paved over the former ball field. At some point, the distinctive cupola on the Field House roof was removed. 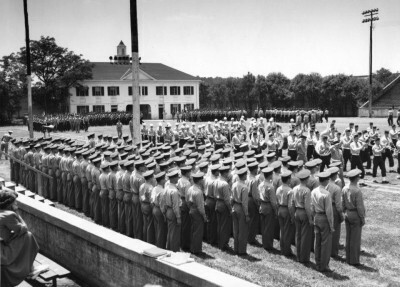 In the ensuing 35 years both the remaining West Stands and the Field House itself were appropriated for various uses, including Campus Police Headquarters, the Facilities Planning and Design, Facilities Operations Customer Service Center, Materials Management and Fire Protection units. The oldest part of the stadium, the West Stands, was demolished in 2005 to make way for SAS Hall, the university’s new home for mathematics and statistics. The large ‘NCS’ monogram which had adorned the central pediment since the 1950s was recently salvaged for posterity’s sake. 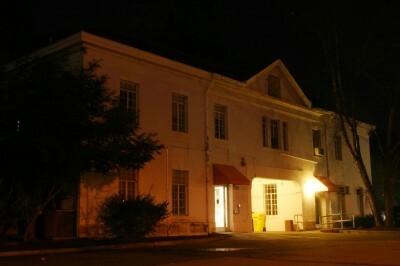 The Field House in 2010, following its service as a staging area for architects and engineers during the construction of SAS Hall. The Future of the Field House? A week ago a group of NC State students initiated a valiant effort to save the historic Field House and restore it for adaptive use. 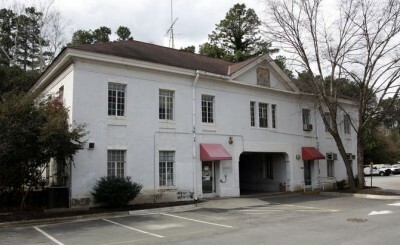 They created a facebook page, Save The Field House, to muster support for the old building’s preservation. In recent weeks a number of lame excuses for its destruction had been bandied about by university officials — ‘it’s an eyesore;’ ‘it has no current use;’ ‘it doesn’t fit in with the aesthetics of the new development around it;’ and my favorite: ‘it creates a safety hazard by obscuring the line of sight of the pedestrian tunnel under the tracks.’ Humbug! 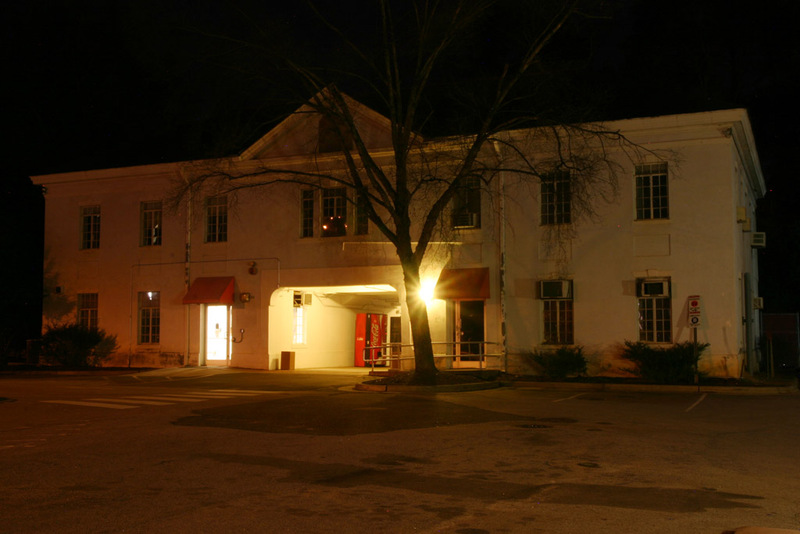 In truth, the old Field House had historic significance to the NC State campus, and promised excellent potential for adaptive reuse. Though historic and old, the Field House is in the right of way (which we already knew) of the railroad tracks, but what we did not know is that a light-rail line is planned as a railway expansion. This will be in same space as the Field House. Though we suggested using private money to restore the Field House before it absolutely had to be torn down, as it would have to be in 10 years or so anyways, it was best to move forward and do the dirty work. Many thanks to the ‘Save the Field House’ students for recognizing the intrinsic value of preserving campus landmarks for adaptive reuse, and for their ‘Hail Mary’ preservation effort. Sadly, though, NC State’s historic Field House will soon exist only as a fond memory. While I don’t like to see the loss of classic architecture, I think parking lots may be the ultimate insult, or the final assault. Thank you for the article about Riddick. In 1967 or 1968 (I’m pretty sure it was ’67) I saw State’s freshman football team play a game there, cannot remember the opponent or result. I do remember that we sat in the west stands. I was a freshman myself in ’67, and that was the only game I ever attended in Riddick. What is the harm in leaving it? Surely it can re-purposed in some productive way? What we have here is a failure to imagine. Sad sign for such an august university. Thank you so much for this very nice article! I do believe that though the Field House in the end must go, this article has been the BEST send-off to it that I have seen. The N&O has come close, but this article topped it good. Ya’ll made this complete with pictures, research, THE WHOLE STORY, and even drew accurate contextual quotes from the “Save The Field House” facebook page. I am one of the two creators behind the “Save The Field House” campaign, and though it will not be ‘saved’ I am proud to say that I think we all agree and are sad to see it go. It will be demolished this coming Saturday morning, March 2nd, and I will be there to see it go. I am a student on campus living in a dorm a few hundred feet from this iconic structure. Maybe the students of today are not up to it. But maybe you ought to consider “occupying” it. With banners and all. If you are not afraid for your future careers and all. Once we were protestors. Once we were citizens. Once we were men and women. Maybe I’m only one of a few that will admit that I lived in the dorms under the East Side of Riddick as a freshman in the fall of 1963. We had a triple decker bunk for 3 to a room waiting for someone to flunk out so we could move. We had a lot of fun in that hall in the dorm that looked “into the bowels” of the stadium..which also included the women’s restroom where the Broughton cheerleaders would change clothes and we would watch! Go Caps!! I took an Army break between 66-70 and came back to see most of Riddick torn down. Even though I moved down to Alexander after Thanksgiving of 1963(when people did start flunking out), my best dorm memories were in Riddick. The smells coming from the old Leazer Dining Hall in the morning were awesome! As a freshman on campus in the mid-80’s, I remember well that parking lot with the West Stands jutting up into the sky. I always laughed at the quirky juxtaposition of “stands” overlooking a lot full of cars. That year I also learned that the stands did serve a functional purpose….at least for one student. I made friends with an out-of-state buddy from PA. One night we found ourselves walking through that parking lot. In a moment of honesty, he confided that on nights when he felt a bit homesick, he found that if he went to the very top of the stands and pulled out his AM radio, he could (on a good night) get reception from a PA radio station. Hearing a little voice from PA soil helped soothe his soul. I used to work in the Leazar computer lab during my senior year (2003). When I would walk to work form my dorm I used to love coming out of the tunnel then walking right through the field house tunnel. I wish I could come see it torn down, unfortunately I won’t be able to make it. Loved the article, thought it was a very proper send off. So, so very sad. We’re losing our history almost daily. Last year it was the Student Bookstore, now the Field House, next year Harrelson Hall. I wonder when they’re going to raze Holladay Hall? Did you really just compare Harrelson Hall to Holladay Hall? Unfortunate to hear that the light rail right-of-way was the final nail in the coffin of this building, and it’s sad to see the last bit of the original football stadium go. While Riddick Field was well beyond my time, the West Stands (and the Morris building, so often forgotten) still presided over the Riddick Lot. While an adaptive reuse for the building certainly could have been found were it not for the rail issue, the truth of the matter was that its importance was all symbolic at this point. The things that made it architecturally distinctive (the cupola, the relief logo on the pediment) had been removed. The location was somewhat awkward. And while it was probably completely solid structurally, the interior was in horrible shape (I spent some time there while an NCSU employee). Still, thanks for an appropriate send-off, and one more thing now just a Wolfpack Memory. I worked for the University Police from 1996 through 2007. I spent many a night in the Field House and have fond memories of it. Although, I DID used to think that if a train derailed at that spot, I would die…. But I still loved the Field House.